We’ve all been there—you’ve enjoyed a hearty, delicious meal and then nature calls. You retreat to the bathroom to do your business and end up clogging the toilet. You can’t just leave it or else the next person to go to the bathroom and discover—well, you get the gist. There are a multitude of other reasons plumbing problems might happen. Perhaps your little one decided to be mischievous and dump the entirety of a family members’ homemade coconut oil-based facial scrub down the sink. Or maybe someone’s long hair keeps clogging up the shower drain (you know who you are), which can equate to a rather unwanted foot soak. If only you had proper privy plumbing skills hidden up your sleeve! For future reference, here is what you need to know to keep your bathroom pipes and drains clear of all manner of clogs! A clogged shower or bathtub can be a nightmare! 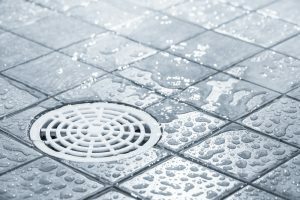 When you shower you want the grime coming off your body to go straight down the drain—not to stay at your feet and make you feel like you’re washing in dirty water. Although many things could potentially cause a shower to clog, the most common culprit is hair. If you’re too grossed out by the idea of doing that, that’s understandable. The professionals at Shamrock Plumbing can take care of it for you. For future reference, though, using a hair guard for the drain will help prevent future hair clogs. Read more about hair clogs and other plumbing horror stories. Analyze the Situation: You should look at the water in the toilet closely. Is the water level lowering, staying the same, or rising? To know what you should do next, take a look at the rest of these steps. Look Inside the Tank: If your attempt to flush made it so the water levels lowered and the water sounds like it’s still running, that could mean that the pipes are clear and the issue could be resolved by maneuvering the handle arm. Look at it this way: your toilet is like a Rube Goldberg machine where everything happens as a result of a domino effect. Although not all tanks are alike, they are similar for the most part. Take the lid off of the tank and find the handle arm which is connected to the handle on the outside. There should be a chain connected to it and a seal at the bottom. Pull the handle up and the seal will raise, causing the toilet to flush. Plunge: If raising the handle arm did nothing, it’s time to plunge. Make sure to only do this if the water is lowering or staying the same. If it is rising, go onto the next step. It’s best to hold the plunger with both hands as this will help you apply more pressure. Place the plunger at the bottom of the bowl so that it caps over the hole and acts as a suction cup. Push down and pull up. This will push water into the pipe and hopefully apply enough pressure that whatever is causing the clog will continue down the pipe. You will need to do this several times. For best results, however, wait ten minutes before starting to plunge and then flush. Stop the Water: There is nothing worse than clogging a toilet and seeing the water in the toilet rise up. If you’re lucky, it’ll stop before going over the rim and onto your floor. If you see the water rising don’t hesitate. On the side of the wall near the bottom of your toilet there should be a valve. Turn it clockwise. This should turn off your water and prevent the toilet from overflowing. You will then be able to plunge the toilet or wait for a plumber to unclog it. If you come across a toilet that is already overflowing, stop the water immediately and then plunge. If that doesn’t resolve the issue, the problem could be due to a malfunction with the toilet and would need a professional plumber’s help. Be cautious and make sure to not be overly aggressive— you could end up making the issue worse by pushing the clog further into the pipe. If that doesn’t work or if the issue isn’t even hair, use drain cleaner. If you don’t happen to have any on hand, try using a concoction of baking soda and vinegar that will fizz up and work away at the clog. Remember, Shamrock Plumbing is Here for You! As every DIY-er knows, not every hack will get you the results you want. 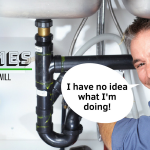 When it comes to plumbing it’s critical to leave the big problems to the professionals. If you can’t get your bathroom sink, shower, or toilet to unclog no matter what trick you try, it’s time to give us a call. We will get your plumbing system back in working order promptly and help you know how to prevent such issues from happening in the future!